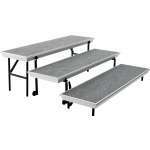 Portable Stages & Risers: Shop Our Extensive Collection! A sturdy portable stage or riser from Hertz Furniture will contribute to the success of any show. How should you position the choir? Performers should be positioned so they can easily be viewed by the audience. Choral risers raise all concerts to an easy viewing height. Stage skirting adds a decorative touch and helps to keep messy electronic accessories out of sight. For traveling shows, we offer a collection of sturdy portable stages and risers, with or without carpeting. All models are constructed from quality materials and designed to support large casts through years of performances. When you make the right choice, you can enjoy years of worry-free shows for your choir, theater club and band. Should I get a stage or risers? Whether for school plays, performances or graduation ceremonies, stages and risers take you to the next level of professionalism. Without them, it&apos;s just not the same. But not all portable stages and risers are created equal. There can be significant differences that will influence which stage or riser you choose for your event. The first thing you need to consider is the layout of your auditorium. Are the seats on an incline, or on a flat plane? If they&apos;re on an incline, then you know that your audience will be able to see what&apos;s happening onstage no matter how far away the seats may be. If it&apos;s set up on a flat plane, then you&apos;ll have to invest a lot more thought into the best way to set up your performance so that as much of the audience as possible has an optimal view. The second thing you need to consider is – what kind of performances will you be dealing with? Do you put on yearly plays or musicals, or just ceremonial performances like graduations? What about a school choir? Does your band perform exclusively at school events like sports games, or do they hold concerts as well? That will help you establish priorities as to which stages and portable risers you really need. What kind of risers should I get? For choral productions or graduation ceremonies, choir risers are the best way to provide the clearest view to the greatest number of people. Although they might look more sophisticated, straight risers provide more visibility than do semi-circular ones. When you want to make sure that the parents and family members in the audience can see their loved ones onstage, traditional choral risers are the way to go. What kind of stage is good for school plays? If plays, musicals and other onstage performances are a focal part of your school&apos;s extracurricular program, you are going to need a good-quality stage. Fortunately, there are a number of excellent mobile stages out there. 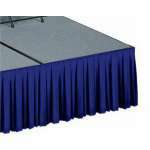 Manufacturers like AmTab and National Public Seating have a huge selection of stages in a wide variety of sizes and materials. Need to configure your stage by yourself? Try the TransFold portable stage series by Midwest. These come complete with portable platforms, guardrails, steps with handrails and even stage skirting. The advantage to portable stages is obvious: they can be set up anywhere, anytime, and they store quite easily. What is the difference between band risers and choir risers? Do you have an active school orchestra? Then band risers are a must. 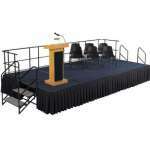 Like portable stages, these come in a wide range of sizes and configurations, many of which can be combined to create the ideal riser for your particular school. Unlike choir risers which are made for standing musicians, band risers are wide enough for chairs so your musicians can sit. Band risers can be stored and used strictly for concerts and performances, or they can be used on a regular basis in your music rehearsal room and then moved to the performance venue as needed. Choosing the right stage, choral or band riser is not an easy task. The Project Solutions team at Hertz Furniture will be happy to help you by walking you through the planning process so that you get it right the first time. Having trouble with furniture financing? Our financing experts will explore your options with you so that you get the best deal we can give. No matter how small or large your order, Hertz Furniture is dedicated to seeing that you get the stages and risers you need, at a price you can afford.